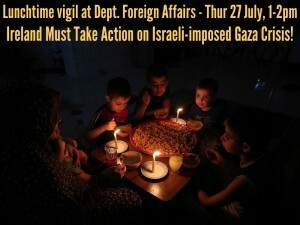 Join us between 1pm and 2pm on Thursday 27th July as we hold a vigil outside the Irish Department of Foreign Affairs (Iveagh House, 80 Stephen’s Green, Dublin 2) demanding that the Irish government take concrete and meaningful action to hold Israel to account for it’s ongoing collective punishment of the people of Gaza under the decade-long cruel and illegal siege. Israel’s latest provocation is reducing the supply of electricity to a few hours per day, making life unbearable for the people. Israel claims it is reducing the supply merely because of unpaid bills, a claim repeated by the Minister for Foreign Affairs, Simon Coveney. Yet, under international humanitarian law, as the occupying power in Palestine it is Israel alone that is ultimately responsible for the well-being of the people who live under its control – regardless of any bills. This is yet another method of imposing harsh living conditions on the people of Gaza in order to punish them and to make their lives unlivable. Indeed, a very recent UN report noted that in Gaza the “‘unliveability’ threshold has already been passed”. Yet, when it comes to the international community – sadly and shamefully including Ireland – Israel continues to enjoy complete impunity in its criminal actions. For the sake of the Palestinian people, this has to end. Israel can no longer be treated like any ‘normal’ country; it is a state that rules over the lives of millions of people who have no voice, no vote and no rights. Words are simply not enough. It is time for the Irish government to call this situation what it is – apartheid – and beyond time for this state to act. It’s time to treat Apartheid Israel like Apartheid South Africa before it and impose sanctions until Palestinians are free. In the immediate term, this means that the Irish government must act now to pressure Israel to restore Gaza’s electricity and to end the illegal siege of Gaza. It is unacceptable that our government not do anything to intervene in this humanitarian nightmare imposed upon Palestinians by Israel. Join us on Thursday to demand action. Even if you can’t make the vigil, you can still take action by emailing the Minister for Foreign Affairs to demand action from Ireland. Click here to take action.